Iyllyana bt Che Rosli sent the latest photo of board for the headgirls with correction of her name replacing the earlier mistake made by the school. 10 years ago it was still there. Will try to visit again and the photos uploaded. Thanks. Here’s the latest list of Headboys and Headgirls. I got the info from my son who is the current Deputy Head Boy. This list is complete from beginning until 2008. Thanks Sin Soon. However 1970 headboy is still missing and headgirl for 1969 is the same name with 1973, is that correct? Will try to edit what is in the blog (thank you for correcting) – but can’t do much what is on the wall of school hall. Mine is also not the same as in my IC. But it is still my name which ever way it is spelled. Karim, I will check back the name of the HB for 1970 and HG for 1969 and inform you. My son could have make the mistakes while copying from the ‘wooden board’ in the hall. FYI, my son’s name is Yeo Zhi Ming. You can find him in Faceook. Nor hisyam bin hj mohd headboys 1990. please contact me. 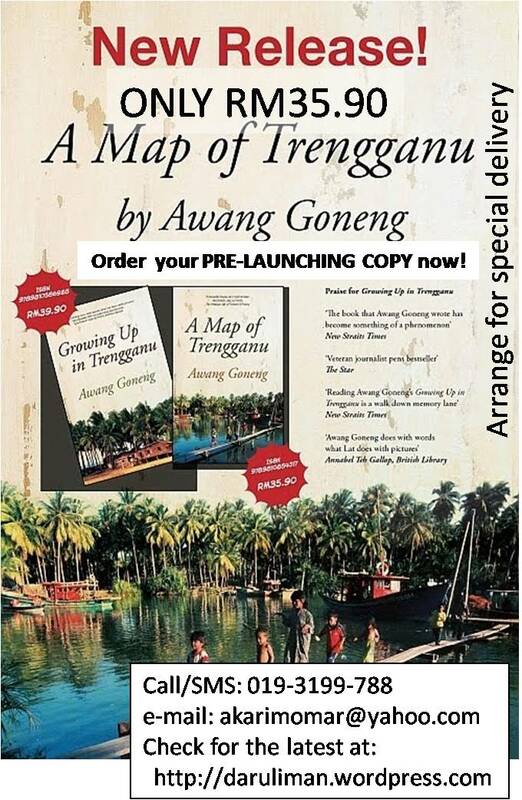 i would like to tell that airil anuar is the headboy of 1999. i was the headboy for 2000 – Andi Taqiuddin b. Ghalam Sani. Taqiuddin, when I saw the name Ghalam Sani, it seems so familiar. I might be wrong but your father could be a former classmate of mine in Form 1 and perhaps Form 2. I used to visit him when he was living in what is now occupied by the government offices in Jalan Pejabat. He was a good friend of mine and we shared many common interests. The last time I met him was, I think, in the late 70’s or early 80’s. If he’s indeed the same person, could you give me his tel No. so that I can get in touch with him. Thanks. i think that explains for the blank 1970’s headboy. It is now rectified. My apology for the mistake. However the error was not due to the blank for 1970 but it was due to in 1988 there were two names listed as headboys. I wonder why that happens – can someone from that era help explain? Salam to your dad who was my classmate and had never met ever since we left school. Permit me to deviate momentarily just to narrate an anecdote involving my encounter with a headboy. 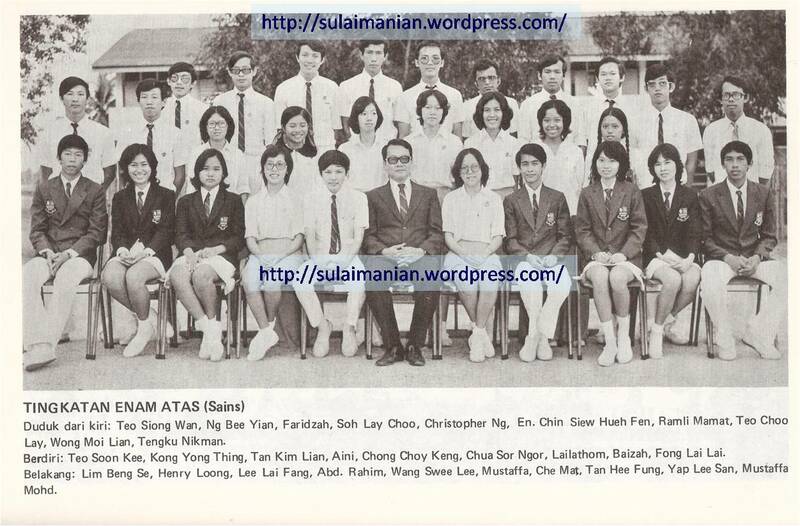 During my early schooling days in SS (late 60s), prefects were held in high esteem and feared too. To young boys and girls who have just entered the secondary school, the prefects were like teachers. I recalled one occassion as afternoon session boys, my friend and I were stopped from running in the corridor (actually sprinting to our class as we were late) by a big tall guy in white long pants (we found out later that he was the headboy). – Boys, where are you going? – Don’t run in the corridor, okay? – Okay. Er, where’s you badge? – Okay next time, please wear your badge when in school, okay? – Er, one more thing, don’t call me sir. I am not a teacher. I was always fond of telling this anecdote to my family and friends, maybe because I became a prefect myself in later years. I wonder how do present schoolboys/schoolgirls look to their prefects nowadays. One of my son listed them as his Number One Enemy while studying in a boarding school! 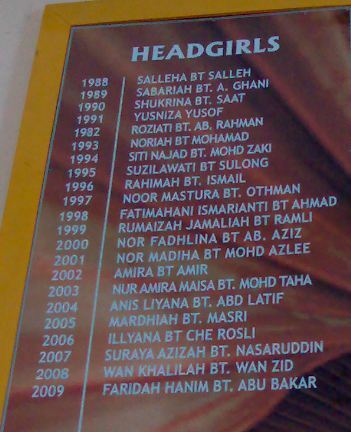 salam 🙂 … 2006 headgirl is not Munira bt Masri… but iyllyana… hmmm… i don’t know they have change the name or not… but, munira is the deputy headgirl… haha…. Sorry for not updating much sooner – as I need to verify personally. In fact there is another dispute for the headgirl. But for now – I will have to stick to what is on the board until the school amend it. Bravo to Airil….he has been our class monitor (1k1 to 4S1) from 1995 to 1998 and quit in 1999 as he was elected as the Headboy ! alot-lot-lot of lots when remembering about ss..
Innalillahi wa inna illahi rajioon.. If I recall right, this is Ahmad of Gendawan Auto that my sister bought a Renault in mid-70s. Innalillahi wa inna illahi rajioon.. Karim, just to summed up this particular update. I knew arwah Haji Ahmad Ab.Rahman personally since school days. He was from Kuala Berang. Did not attend the funeral but my sister Hajjah Norhayaty (they were classmate) did. 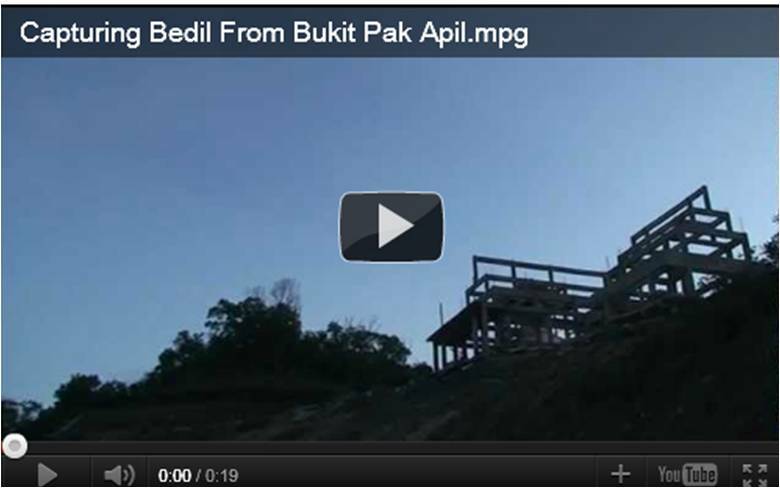 THOSE DAYS HE WAS BETTER KNOWN AS – Mat Tok Bilal. Al-Fatihah. The head boy for 1989 Noor Hisham Hj Mohd had passed away few weeks ago. He is my classmate in 1986. Al Fatihah. ps – we are the batch who creates history for SMSS in SRP exam in 1985 with 100% passed record. Innalillahi wa inna ilahi rajioon. Semoga Allah mencucuri rahmat ke atas ruhnya. Saya rasa mcm pernah dengar nama Noor Hisyam tu. Takziah ke atas keluarganya. Dia sakit apa, ya? 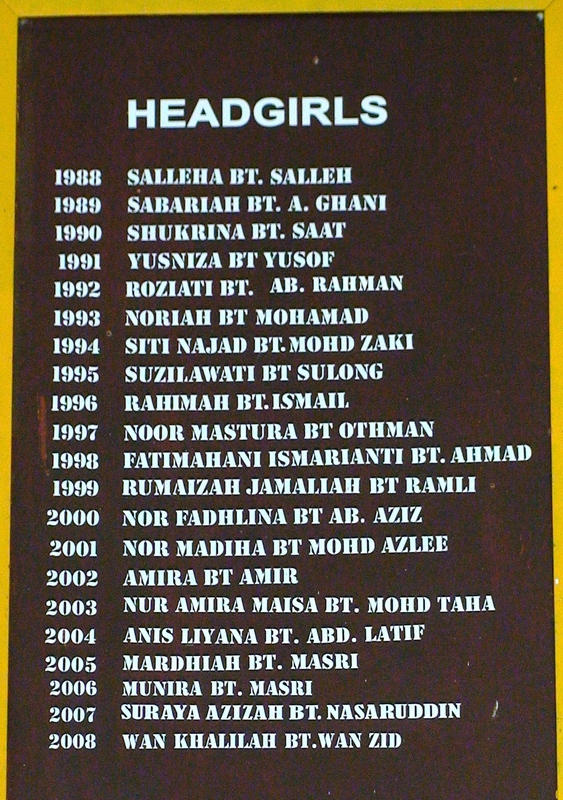 salam, saya yusliza yahya adalah headgirl bagi 1991. Nampaknya ada kesilapan ejaan nama disitu. Harap maklum. Noted. Dah ditukar – sekadar di blog ini sahaja. Yang di dalam dewan sekolah itu perlulah hubungi pihak sekolah. Baik, saya betulkan. Saya dasarkan ejaan dari yang terpampan di dalam dewan sahaja. Maaf. Lagi elok kalau diletakkan gambar….dulu dan kini….hmmmm…camner moderator? setuju? Cadangan baik. Akan diusahakan. Amat memakan masa memandangkan single-handed sahaja dengan blog ini. this is the 1st timei am writing in this facebook ! or is this just the sulaimanian web page – oops !! is it the same ? any way who cares ! i just wany to let all those boys and girls know that i ( Mr nava )am very much alive and kicking. I was in contact with Karim for a while but when he asked me write something i chickened out !! And yesterday 19th Dec, Kazaruddin called me ( i wondered how he got my number ) and we had a long.long chat. I wanted to say , hey your phone bill !! Anyway i had a wonderful chat with him. And 2day, MOhd Ali called me from KT ? and chatted for more than half-an hour. My grandson( 8 ) came to me later and said ‘ which girl were u talking to for so long ?’ anyway it was wonderful. Mohd Ali also sent me Sin Bin’s number – so i called him and had a short conversation. Anyway, to all you wonderful people out there – i live in Seremban. from SS i went to SDAR, Tanjong Malim and when SDAR shifted to Seremban – lock stock and barrel- i opted to follow, although i am a Perakian. i took optional retirement in 1990 and went to a new private college, then -Kolej Tuanku Jaafar, in Mantin, also in Negeri until i retired in 2005. Thats the story of my ‘active life’. now its gardening,grandchildren ( 4 ) and some games. more later. bye and god bless u all.